PowerCommands - useful extensions for the Visual Studio 2010 adding additional functionality to various areas of the IDE. DevExpress CodeRush Xpress - Coding assistance, Intellisense navigation,etc. AnkhSVN - Subversion Support for Visual Studio. Ghost Doc - Simplify your XML Comments. Visual Studio Color Theme Editor - make your VS2010 look pretty with themes. VsVim - VIM emulation layer for Visual Studio. DPack - FREE collection of Microsoft Visual Studio tools. VSFileNav - fast searcher with wildcards + camel case searches. Sonic file finder - fast and convenient search. Source Outliner - not available on this link. Triple Click - Makes triple click select an entire line. Spell Checker - not available on this link. Remove and Sort Using - Adds a context menu entry to Solution Explorer that sorts and removes using statements on every file in the solution, project, or on the individual file. Format Document - Adds a context menu entry to Solution Explorer and the code window that executes the Edit-Advance-Format Document command on every file in the solution, project, or current code window. Open Folder in Windows Explorer - Extends the Open Folder in Windows Explorer context menu option to the code editor and to all files in solution explorer. Find Results Highlighter - Highlights the search text in the find results windows. Regular Expressions Margin - A margin which exposes .Net Regular Expressions search and replace capabilities on a given code window. VSCommands - not available on this link. StyleCop - StyleCop analyzes C# source code to enforce a set of best practice style and consistency rules. Extension Analyzer - Extension Analyzer helps debug issues with VSIX Components, Visual Studio Packages, PkgDef Files and MEF Components. CodeCompare - Code Compare is an advanced file and folder comparison tool. This programming languages oriented diff tool can be used as a Visual Studio add-in and as a standalone application. Numbered Bookmarks - Numbered Bookmarks allows users to create and recall bookmarks by using numbers. User can create 10 bookmarks (starting from 0 to 9). 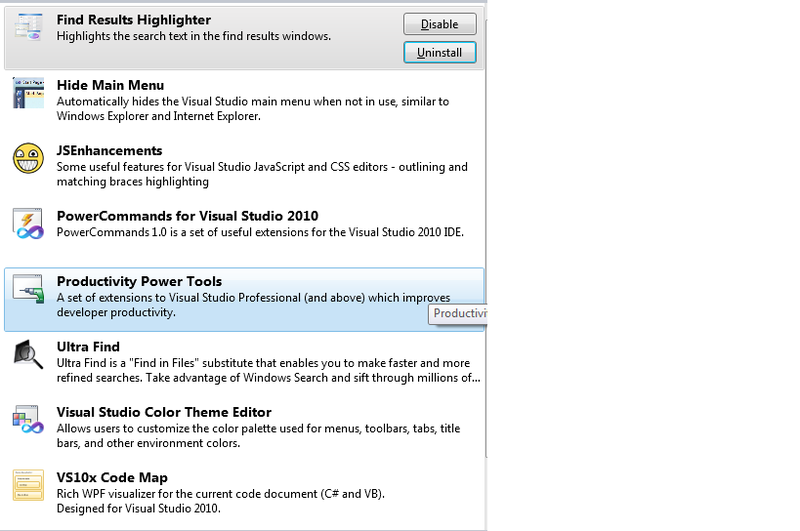 Visual Studio 2010 Pro Power Tools - A set of extensions to Visual Studio Professional (and above) which improves developer productivity. Code Contracts Editor Extensions - Displays Code Contracts (when editing C#) in code, Intellisense, and in metadata files. NuGet (formerly NuPack) is a free, open source developer focused package management system for the .NET platform intent on simplifying the process of incorporating third party libraries into a .NET application during development. Even if you use other SVN shells outside VS (like TortoiseSVN), I recommend to install this Source Control Provider to automatically keep track of file renames, deletions and the like. It takes a while to configure it properly, but it can be quite useful. It's way better than Resharper (which by the way always slowed down my VS to a crawl), it works with C# and VB.NET (including refactoring) and the support and community is excellent. Worth the price tag. And yes, it does support 2010 (in RC at the time of this writing). I can't code unless my VS2010 has a StackOverflow-like theme. I personally prefer this over AnkhSVN since its not an SCC provider and doesn't add extra files to my repository. VisualHG is a Mercurial Source control plugin that drives TortoiseHG from VS. I'm a big fan of Mercurial & DVCS. VisualHG makes it nice n integrated. Git fans - I'm not asking for a flame war. Hg is just my brand. VS10x Code Map That is very cool. Easy jumping to property, method. And easy expand collapse region and more. World of VS Default Browser Switcher for easily switching browser in web projects. Code Contracts Editor Extensions, a free extension which provides information about inherited contracts for the method you're currently working on, and a list of contracts for any methods that you're calling. Unfortunately, the latter feature conflicts with Resharper, but the former still works fine. RockScroll (free) - Double-click on a word/symbol highlights all occurrences of that word/symbol. Also replaces the scroll bar with a preview of your code, with edit spots and "all occurences" lines highlighted. Example of use: want to see whether a variable is used anywhere else in current source file? Double-click variable, look at scroll bar for any red highlights. AtomineerUtils Pro (not free, $9.99 USD) is, in my opinion, better than Ghost Doc. But, just like Ghost Doc or any automatic documentation generator, the generated documentation is meant to be edited to be of any real value. Small tool which underlines hex colors in stylesheets with the correct color. I really like how it integrates into the editor. How many times have you wanted to send a project to a friend or upload it to a web site like MSDN Code Gallery only to find that your zip file has lots of stuff that you don't need to send in it making the file larger than it needs to be. bin folder obj folder TestResults folder Resharper folders And then if you forget about removing Source Control bindings whoever gets your project will be prompted about that. As someone who does this process a great deal I decided to share with you my code for cleaning a project. I can't live without DPack - especially when working on large projects, makes navigating between files and members much easier. And it's free. ...and so on. Much easier for me then finding my way around Project Explorer. Vingy 1.0 is simple, but effective add in for Visual Studio 2010 so that you can search the web in a non intrusive way, and can filter results based on sources. You can bring up Vingy either by clicking View->Other Windows –> Vingy Search Window from the Visual Studio IDE, or just by high lighting some text in the document and then clicking Tools –> Search Selected Text (Ctrl + 1). This is my list of extensions. The list on this is pretty comprehensive, so I spent sometime to find the extensions that I need. Here is the snapshot. Hope it will help someone. I tried installing Codemaid, and it appeared to be a nifty addon, but my Visual Studio response became very slow. Felt like some threads were doing some work all the time when Codemaid was on. So uninstalling for now. VSFileNav - (Free) A Find File in Solution tool (cross between SonicFileFinder and Resharper). Lightweight, easy to use and fast (I got sick of the huge startup time with Sonic). Disclaimer : I wrote this tool. The “Quick Add Reference” extension augments the smart tag that VS shows for unrecognized types giving you a chance to add the corresponding assembly reference for that type plus corresponding “using” clause if needed in a single shot. Not the answer you're looking for? Browse other questions tagged visual-studio visual-studio-2010 or ask your own question. What are your top Visual Studio 2010 extensions? 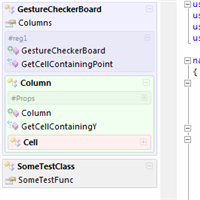 Useful Visual Studio Extensions For New C# Developer? How can I create a custom image adorner add-in for numerical arrays in Visual Studio 2010? List of Open Source Visual Studio Extensions?